Books given to me by a good friend last year. I'm not ashamed to admit I was doing pregnancy reading before I was pregnant! I've spent the last week soaking in the outpouring of love from friends and family following our announcement last Thursday. Holy smokes! You all know how to make a couple feel loved! We've received the sweetest and funniest calls, e-mails, and cards. I can't thank you enough! Now that I'm in the second trimester, things have become more real. A little bump showed up when I was pushing 13 weeks, and it feels like it's growing at warp speed now. I need to have a heart-to-heart with this child to let him/her know that Mommy isn't built to deliver a giant baby. Grow, baby! Grow! ... But not too much? This bump may be small, but I can't resist touching it. I know. I, too, used to think that barely-showing pregnant women touched their bellies just to get attention, but it's not true! It's hard to resist! Rubbing my belly feels good to me, and I'd like to think it's somewhat soothing to the baby too. Maybe? I'm also feeling more "myself" this week which is a huge relief. Weeks 7 through 13 were borderline miserable. Yes, I knew there would be nausea, but no one had been as honest as "It will be a small victory to work full-time, let alone make it to work on time and avoid the sudden urge to throw up in the trash can under your desk." (Yes, I was late to work a handful of times, and yes, I came face-to-face with my trash can once. I also knowingly skipped two school assignments, because I that crummy.) I struggled to function sometimes, but several weeks and only one bout of tears later, I think I've washed my hands of the first trimester woes. Still keeping my fingers crossed. Bring on the second tri! So that's where I'm at. I'm feeling much better these days, I finished out my last class with an A-, I'm getting back in the swing of things at work, and I start my next two classes next Tuesday. Oh, and I'm looking forward to a three-day weekend! I've also realized that blogging has completely opened up my pregnancy world! I have so many women at my finger tips who are willing to share stories and tips, and it has been so helpful! You're so cute! Of course you were reading first; you're already a super prepared mama! I'm so glad that you're feeling better and are starting to enjoy your pregnancy. I, for one, cannot wait to see that bump grow :-) Any maternal instinct gender predictions? 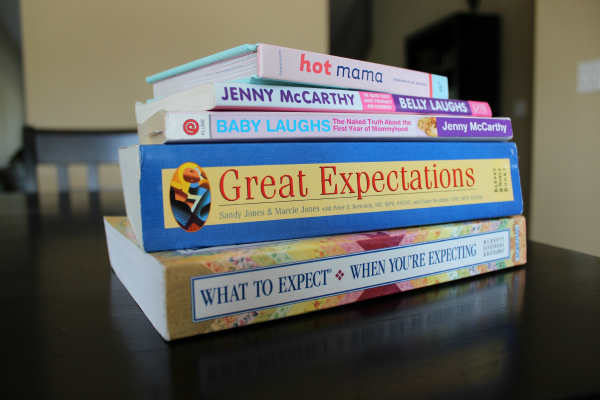 I love that you were reading pregnancy books before you got pregnant. True story: I didn't read any my second pregnancy. Haha. Anyway, I'm glad you're feeling better nowadays. Can't wait to watch that bump grow! !